LASIK (Laser-In-Situ Keratomileusis) is currently the most common type of laser vision correction procedure. It is an extremely safe and effective outpatient procedure that is suitable for low, moderate, and higher prescriptions. As a result, LASIK is one of the most frequently performed elective healthcare procedures in North America today. At SoCal Eye, our state-of-the-art technology and expertise allows us to provide optimal individualization for each patient. With the diversity of laser procedures available, we can offer the best fit for almost any vision issue. If you lead an active lifestyle and are bothered by the inconvenience or appearance of glasses (and the risks of contact lenses), you may be a candidate for laser vision correction. Likewise, if allergies, dry eye, or other eye disorders make contact lenses too irritating to wear, laser vision correction may provide a safe, convenient alternative. LASIK can treat a very broad range of nearsightedness, astigmatism, and farsightedness in people who are at least 18 years old and in good general health, have no eye diseases, and have had no significant change in prescription over the past year. In this procedure, the surface layer of corneal tissue is precisely formed into a flap by the femtosecond laser and folded back from its usual position. The laser then gently reshapes the surface, and the very thin flap is placed back in its original position, where it bonds naturally. The procedure takes us about five minutes. Most patients say they have no pain with LASIK, and often return to work the next day. LASIK can treat nearsightedness, farsightedness, and astigmatism. With monovision or blended vision correction, LASIK can also correct the need for reading glasses, caused by presbyopia. Using WaveScan®-based digital technology, originally developed to reduce distortion in high-powered telescopes, we can now identify and measure eye imperfections that in the past were not measurable. The data is then analyzed by the surgeon and used to customize every procedure. For some patients, wavefront-guided surgery may be advantageous. Photorefractive Keratectomy (PRK) is a laser vision correction procedure that produces results identical to those of LASIK, with the caveat that the recovery time is longer. LASIK and PRK are procedurally different, as instead of creating a corneal flap (as done with LASIK), corneal epithelium is simply removed by the surgeon without that flap creation. With PRK, the epithelial layer regrows within a few days or weeks after surgery, which is why PRK patients have a slightly longer recovery time than LASIK patients. However, unlike LASIK, there is no concern for potential flap complications post-surgery. PRK is offered as a good alternative for patients who are not qualified for LASIK due to having thin corneas, previous eye surgery, or other health factors. Also, people who have hobbies where the eyes may come into physical contact with something (such as martial artists) may prefer PRK over LASIK. If you are interested in learning more about Photorefractive Keratectomy or would like to schedule a free consultation, contact our SoCal office today! 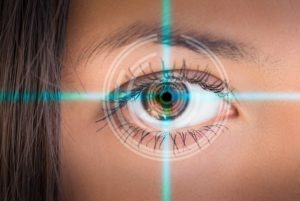 Many people who previously would have been considered non-candidates for laser vision correction can now have a laser procedure called Advanced Surface Ablation. Formerly known as PRK, this LASIK alternative has come a long way from its beginnings as an early laser treatment first performed in Germany in 1987. Historically, one of the biggest drawbacks to PRK was the variability in healing which limited the range of predictable correction. Today, however, with advances in lasers, treatments, and pharmaceuticals, these problems have been essentially solved. Now known as Advanced Surface Ablation, this surgical procedure is effective in correcting almost any degree of refractive error—from nearsightedness to farsightedness to astigmatism. Technically, it’s simpler than LASIK because no corneal flap is created; the surgeon removes a portion of the cornea’s surface cells, and uses the excimer laser to vaporize away microscopic amounts of corneal tissue. By modifying the shape of the cornea, light rays are allowed to focus correctly on the retina to provide clear vision. Results for previous non-candidates with Advanced Surface Ablation have been excellent. In fact, for certain patients, it is the laser procedure of choice. At SoCal Eye, we are proud to offer Advanced Surface Ablation as an effective laser option for those who are not LASIK candidates.